The Star #17 tarot reading interpretation relates to Aquarius – Is the eleventh house of the zodiac – the one that rules social groups and technology. As well nowadays we are in the Aquarius era. Aquarius is ruled by Uranus, the planet of freedom, rebellion and reform. In the tarot Uranus corresponds also to The Fool. In both tarot The Fool and The Star we can see a clear depiction of the dreamer who is not afraid to follow his heart. The Star is associated with the number 17, which equals 8 (1+7=8). Eight is Strength, the quality needed to accept your faults and love yourself in spite of them. We can see in the picture seven stars, in Greek mythology the Pleiades were seven nymph sisters who attract the attention of the evil hunter Orion, to save them from this pursuit, the god Zeus transform them into doves. Flying upwards they reached the heavens and became stars. Following The Tower, that relates to the EGO structure breaking down, because of false ideas about who we are; The Star comes next symbolizing that we have are finally stripped of all false misconceptions about ourselves. 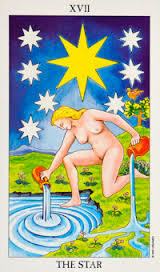 In the Star # 17 tarot reading interpretation the female in the picture has one foot on the ground- representing her practical nature and the other foot in the water – representing her intuition and emotional and inner side. The bird pecking the fruits on the background tree is symbolic of the opportunities coming to us along the path of life. When this woman will end her meditation, she can turn around and see the many possibilities open to her. Meanings: It’s time to take a look at your astrological chart for guidance. Your destiny is written in the stars. There is help from above. Hope, new opportunities, a fresh start, inspiration, confidence, harmony, education. Healers, Astrologers, Psychic advisors, Mindfulness and Healing arts professionals, lightworkers. Difficulty accepting help being offered.